I wanted to make several new coils and so it became worth while to make a simple winder. The coil is mounted on a 1/4" dia 3 ft threaded rod which was to hand - if you are buying something get something more substantial say 1/2".The base and end stocks are just drilled chipboard - no bearings - no sign of wear so far. One 9" by 8ft piece of 5/8" contiboard and some 1.5" square wood built the frame with some 1/4" dia 4" bolts. The end stock can be moved to accommodate coils up to 30" long and 1 foot diameter. The electric motor is the handy kind that comes with a chuck - as power drills can be bought cheaply (under a tenner in Argos UK) - it makes little sense to pay more for an electric motor. 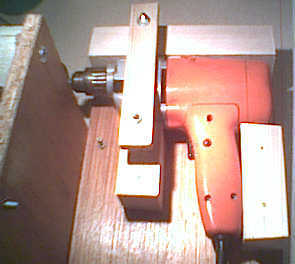 I use a variac to control the speed - though a variable speed drill could be used. The wooden pieces hold it in position. An alternative source of motor and foot switch might be an old sowing machine. The drill is geared down using a fan belt. The pulley at the drill is just an M10 bolt and some washers. The large pulley is sold in a hardware store (B&Q) as a buggy wheel - the rubber tyre can be cut or levered off. 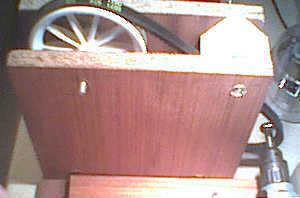 The wheel is fixed to the thread rod using nuts, washers and araldite. The pulleys. I just got the cheapest fan belt from Halfords. 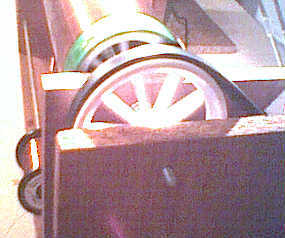 Another wheel is fixed to the other side of the rod to drive the coil form. I found wheels that almost exactly fit the pipe that I am using. Only the wheel at the drive stock needs to be fixed - ie more araldite. 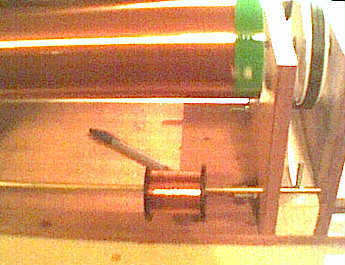 The wire spool is one a brass rod below the coil. 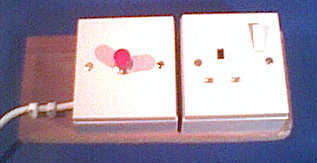 In use a foot switch is highly desirable. I ran the wire through a rag in my left hand to tension it, and I used my finger nail to position the wire on the coil, with my third hand I turned it on and off. I also found it useful to rotate the coil when I was varnishing it and for a little while afterwards to prevent runs. The motor does tend to get hot after a while - as it runs slower the air cooling is also reduced. Footswiches are expensive, so I used a simple push switch (rated at 1.5A), mounted in a standard white socket box.